So much going on at H.O.P.E. 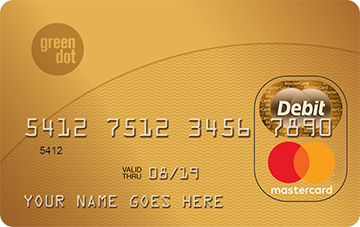 Raffle tickets for your chance to win a MasterCard Gift Card worth $350 are available for purchase at H.O.P.E. for Animals. Tickets are just $5 each. One winner will be drawn at the Parrot Head for Paws event on Saturday, April 28th. Need not be present to win! At H.O.P.E. 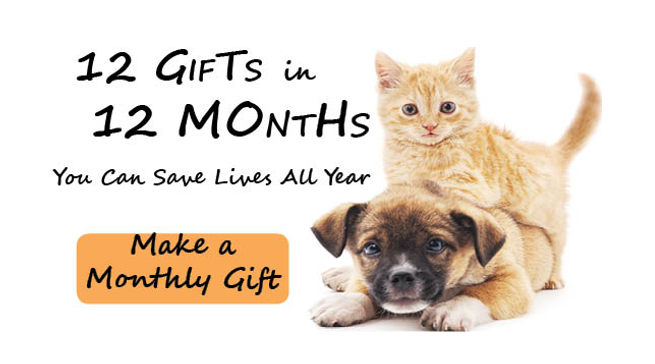 for Animals it is our MISSION to eliminate the preventable euthanasia of companion animals and community cats through low-cost spay/neuter and wellness. This graph - shows the impact our local community and Fort Wayne Animal Care & Control has seen with our efforts. We are so proud that we are helping to make a notable difference! 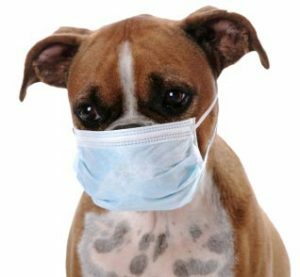 "Canine flu spreads in one of two ways: movement of infective dogs between communities and movement of contaminated people between dogs. 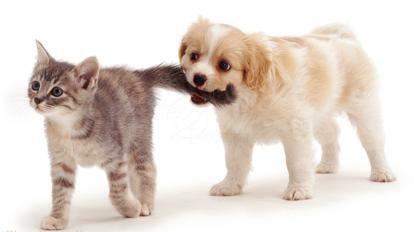 Dogs transmit it to each other through direct contact with respiratory secretions delivered by barking, coughing, or sneezing. They also can acquire the virus through contact with contaminated surfaces or items such as food or water bowls. 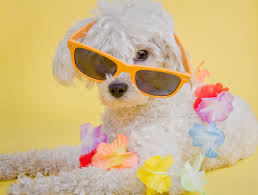 Dr. Dubovi said there is some evidence that dogs infected with H3N2 shed the virus for longer periods than dogs with H3N8." Feral cats are a leading contributor to pet-overpopulation and preventable shelter euthanasia. 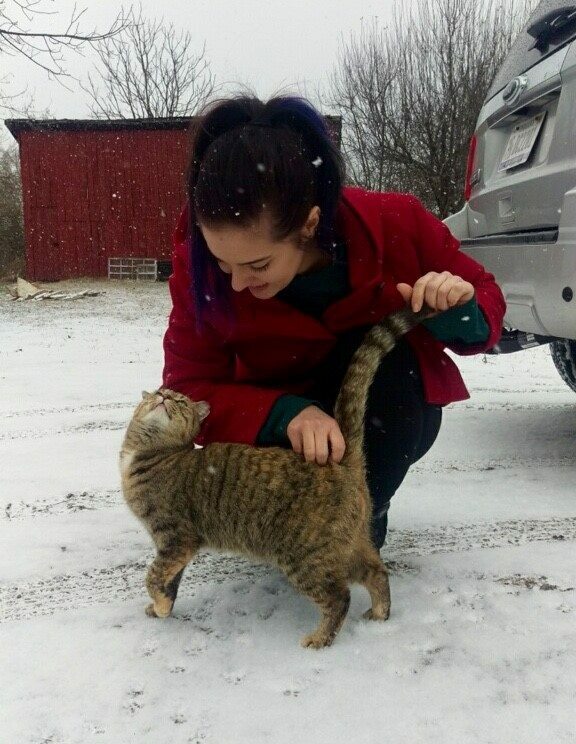 Emily, our new Community Cat Coordinator wants to remind you that spring is "kitten season" and we want to raise as many funds as possible to help community cat care-takers to get those free-roaming cats spayed or neutered. Can you help us and "Spring" for a spay? We are looking for businesses that want to reach loyal, pet-loving supporters, and to have a reach of nearly 100,000 people in our community. Interested? Click on the Sponsorship Opportunities link below! Donate your old car to H.O.P.E. 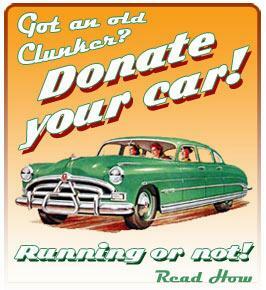 Did you know that your old clunker can save animals lives? Donate your old car/van/truck to H.O.P.E. for Animals through the link below. The proceeds of its sale with help animals in need. H.O.P.E. for Animals is a 501c3 nonprofit. We are reliant on donations and grants to operate. With support from friends like you we were able to help thousands of families and pets in 2017. 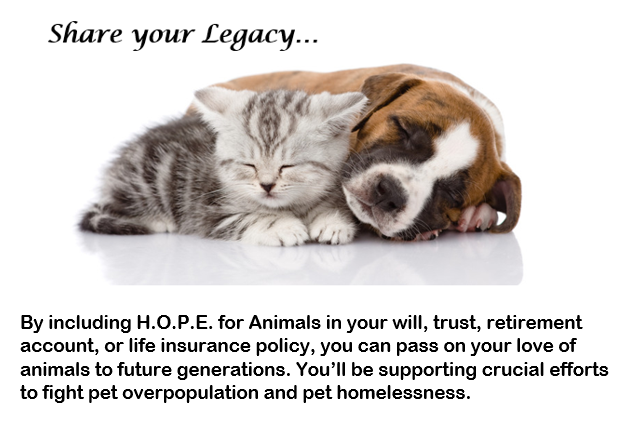 To learn more about legacy giving, please reach out to our Director, Allison Miller, at AMiller@hfafw.org.